Good beer isn't something you'd associate with hip-hop. Champagne and cognac seem to be more that genre's speed, and you'd be forgiven a quizzical head-tilt at the news that British rapper Professor Green has a beer out bearing his name. Signature Brew's selling point is brewing beers with the collaboration of musicians, and the good Professor's beer was the first of these I noticed on the scene, over a year ago. With a confession of my remission and tardiness to the party, I cracked a bottle and prepared to get all thugged out. Remedy pours a hazy, dusty tone just shy of golden and settles to a thin but bumpy pale head. The first scent is woodsy and a little earthy and dangerously straddles the line between subtle and weak. The first taste is rich and a little like an environmentally irresponsible bite into a young sapling. The citrus taste hangs around for the whole of the drink, with a bitter aftertaste building up. There's a very lagery quality to it, it's undeniable, and after the first mouthful the beer doesn't throw any flavour curveballs, keeping it simple and citrusy. Bare bones carbonation keeps the texture more peppy than poppy, and it's quite well balanced in this respect. I had high expectations for this beer absolutely stinking of dank weed, and even had a partially roached pack of Zig-Zags ready as a prop for the photography end of the bargain. I guess the whole "it tastes... green" nudge-nudge spiel of the label gave me that suggestion. Instead we have before us a workable blonde which won't set the world on fire, but is functional and sessionable. In the spirit of fairness it must be said that Professor Green could have cut a deal with Carling to put his cheeky face on their cans for a limited run and probably made an absolute mint in the process. Remedy isn't a great beer, but he and Signature Brew have given it a good go. It's worth a shot, and retails for not very much at Morrison's. Sessioned hand in hand with a barbecue that features chicken heavily it could go places. 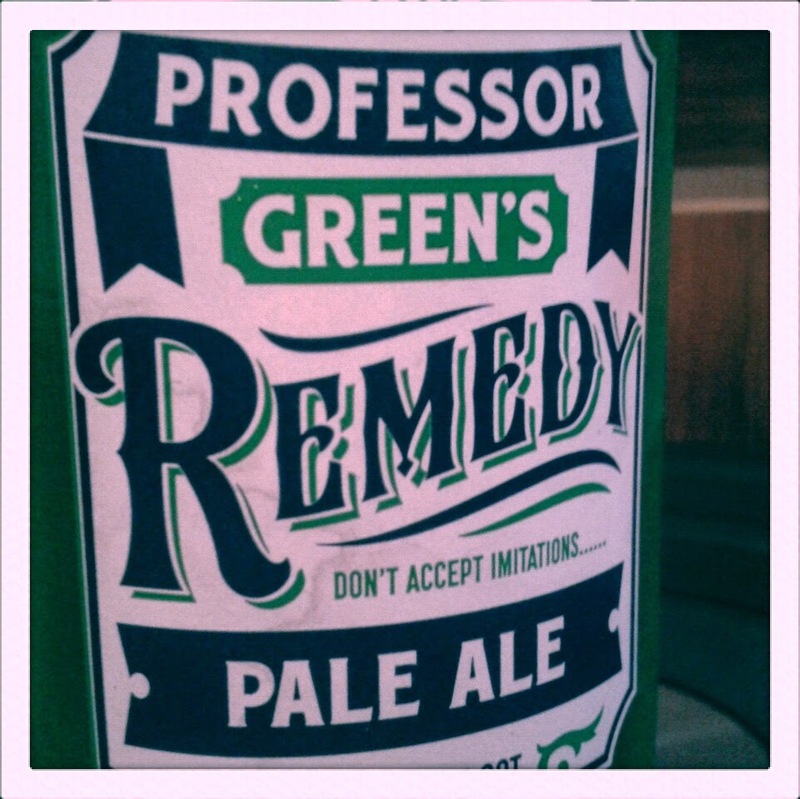 I'm not convinced Professor Green is affiliated with a university. Why is it OK for hip-hop artists to assume doctorates and professorships? If I put that sort of thing on my CV the police are all knocking on my door.